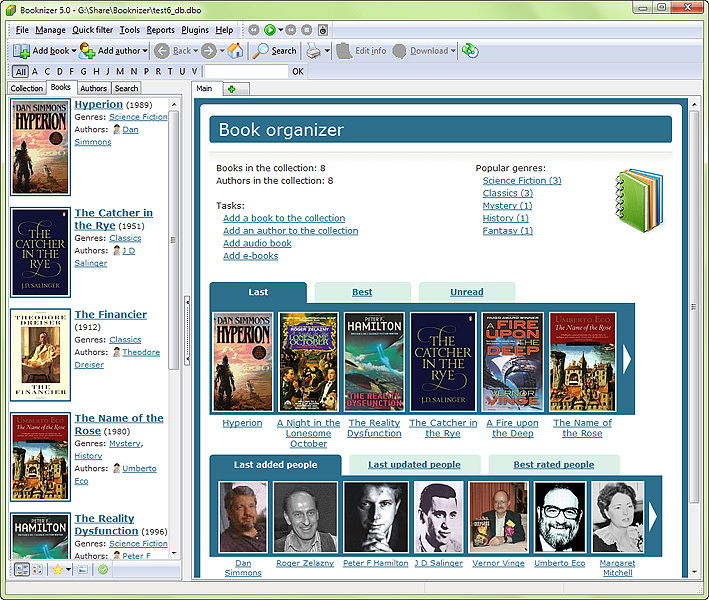 Free Download Booknizer 8.0 - A powerful book organizer for home library. Before electronic books and e-book readers, the maximum size of your home library was limited to the size of your apartment or house. Now you can collect thousands of works under your roof without replacing all furniture with bookshelves. However, unrestricted accumulation of books will inevitably lead to chaos, when the owner does not know anymore what books he or she has and where they are stored. Booknizer is a powerful book organizer and a great helper for everybody who loves reading. It will collect and organize information about all books from your library, including electronic (MOBI, EPUB, FB2, PRC, PDF, DOC), paper and audio books (MP3, M4b, MP4, and others). The program can scan folders containing e-book or audio book files, retrieving available information (summary, cover, publishing year etc.) from the files. It is also possible to add books by title, barcode or ISBN, which is helpful for paper books. Besides books, Booknizer works with authors: it will download the author's bibliography, biography, photos, interesting facts. You will be able to browse information about books that you have not read yet and add the books that you find interesting to your wish list. With Booknizer you will discover new connections in your own library, learn more about books and authors, will be able to select interesting books easily. The book organizer allows searching and sorting your books in different ways, selecting books by multiple criteria. For simple selections (for example, by genre), a single click will suffice. To find a particular book, just enter a few letters from its title into the quick search field. Booknizer will remind you where your favorite book is stored, or whom you gave it. Electronic books can be opened directly from the catalog, audio books can be played with the built-in or an external player. You can also create and print a report about your library or a part of it. Organize your home library easily with this smart book organizer!